See the results from our past clinics below and contact Brittany Lindberg at blindberg@dra.gov for more information about our IRT medical missions. Through a partnership with the U.S. Department of Defense and the U.S. Military’s reserve forces, the DRA hosts the Innovative Readiness Training program in Delta communities each year to bring medical, dental, and optical care to Delta residents that are uninsured or underinsured and in need of quality healthcare at no cost to the patients. The IRT program improves military readiness by providing trained military medical personnel with in-field emergency response training while simultaneously providing quality healthcare services to communities throughout the Delta region. By utilizing their extensive resources, the military is able to meet some of the region’s most urgent health needs. DRA works closely with Delta communities and the Department of Defense to assist with the application process as well as planning and implementation for the two-week medical missions. If interested in applying to be an IRT community, please contact Brittney Lindberg at blindberg@dra.gov. Community leadership is encouraged to familiarize themselves with the program and requirements by visiting irt.defense.gov. Applications for IRT medical missions are currently being accepted for Summer 2018. To be eligible communities must have high levels of need for healthcare providers as well as qualify as rural by having a population of less than 50,000 residents. *Click the name of the IRT Mission to download a printable flyer with additional information. *FINAL FIGURES: During a 12-day period, servicemen and women from the U.S. Department of Defense served more than 3,000 patients from Louisiana and Mississippi, performing over 8,500 procedures valued at nearly $1.4 million. *FINAL FIGURES: During 10 days of medical care, over 200 servicemen and women from the U.S. Department of Defense served almost 4,500 patients from Kentucky, southern Illinois, and southeast Missouri, performing almost 13,000 procedures valued at more than $1.5 million. *FINAL FIGURES: During 20 days of medical care, 400 servicemen and women from the U.S. Army, Army Reserve, Air Force Reserve, and Air National Guard served more than 6,500 patients from Arkansas, Mississippi, and Tennessee, performing over 15,500 procedures valued at more than $1.5 million. *FINAL FIGURES: Reservists provided medical, dental, and optical services to nearly 4,000 Black Belt residents. *FINAL FIGURES: During ten days of medical care, reservists from the U.S. Army Reserve saw more than 4,200 southeast Missouri residents with medical, dental, and optical care, peforming more than 13,000 procedures. *FINAL FIGURES: Over nine and a half days of medical care, reservists from the U.S Marine Corps, Navy, and Air Force provided more than 6,000 Alabama residents with medical, dental, and optical care through more than 18,000 procedures. *FINAL FIGURES: Over nine days of medical care, reservists from the U.S Army, Navy, and Air Force provided more than 3,000 Arkansas residents with medical, dental, and optical care valued at more than $1.2 million. *FINAL FIGURES: During 11 days of service, the U.S. Army Reserve provided no-cost medical, dental, and optical care to more than 1,500 northeast Louisiana residents. *FINAL FIGURES: During 11 days of service, the U.S. Army Reserve provided no-cost medical, dental, and optical services to more than 3,000 southern Illinois residents. 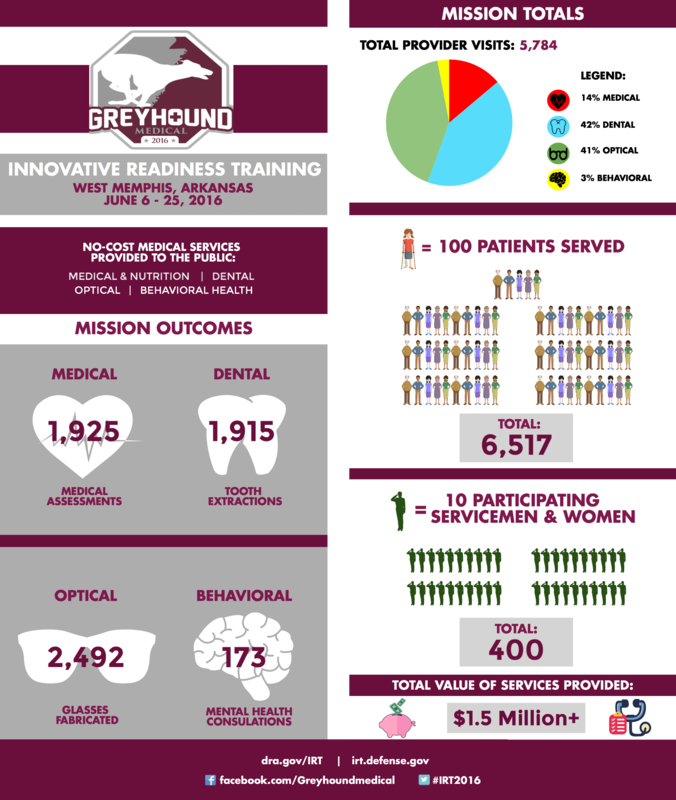 *FINAL FIGURES: Over 10 days of service, the Navy Reserve and Air National Guard provided no-cost medical, dental, optical, mental, and health education to more than 3,100 southern Louisiana residents!